"Roads were made for journeys not destinations"
Kia Ora, and welcome to Eighth Wonder X – the world's first carbon neutral, door-to-door, high-end travel experience. 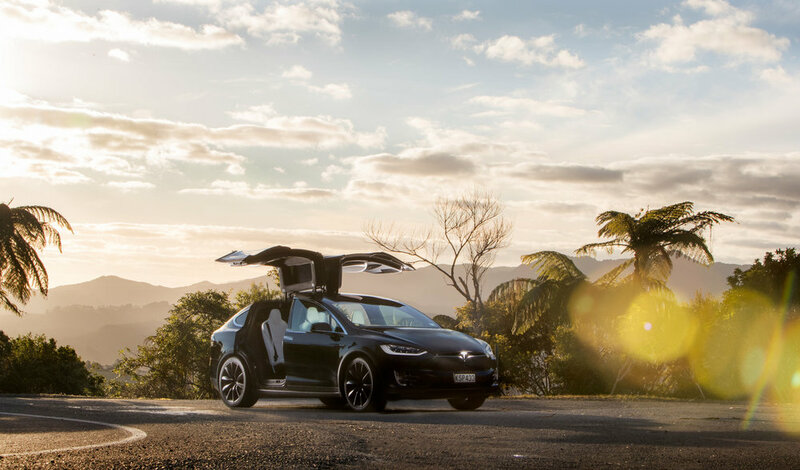 Your unique journey, in the equally unique Tesla Model X vehicle, will start from the picturesque Bay of Islands in the 'tropical far north' of New Zealand, and end on the rugged west coast in the southern part of the North Island. In between, we have assembled a truly spectacular and wonderful journey that takes in the very best New Zealand has to offer in the way of scenery, food, wine and culture – along with luxury accommodation at a stunning selection of lodges and boutique hotels. This promises to be one special journey, and we look forward to hosting you throughout this fantastic experience. Upon arrival at Kerikeri Airport, your Tesla Model X will be waiting for you, along with an Eighth Wonder representative who will give you a detailed rundown of the vehicle before you depart for Kauri Cliffs. 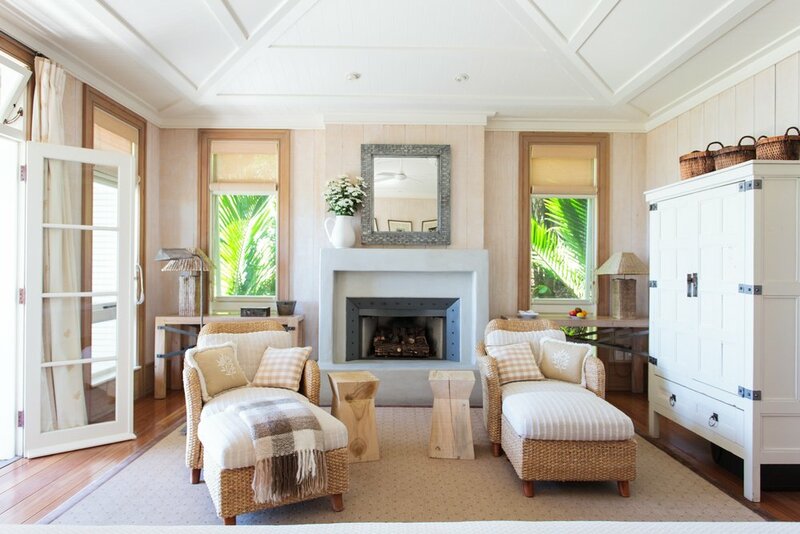 Arrive at Kauri Cliffs, and enjoy the afternoon at your own leisure. This first day concludes with evening cocktails and canapés, followed by dinner in the lodge dining room. 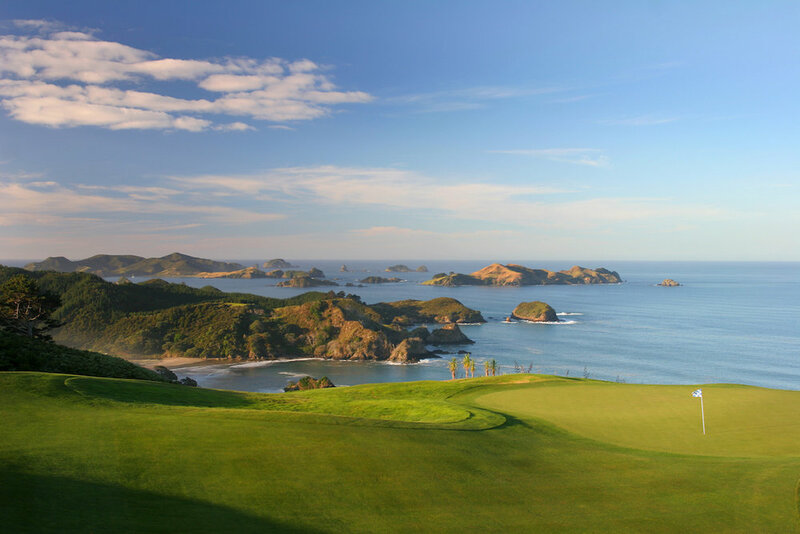 Your first full day at Kauri Cliffs begins with 18 holes of golf around this jaw-dropping championship course. Lunch will be a BBQ at the property's private Pink Beach, which combines one of the most beautiful beaches in the world with freshly grilled local seafood or lamb, partnered with fine New Zealand wine and cheese. Following lunch, you will be left to enjoy the afternoon at your leisure, or to take one of a number of great walks available on the property. Pre-dinner cocktails and dinner is served in the lodge dining room, or at one of the property's romantic, private dining spaces, and can be taken at a time convenient to individual guests. On your second full day at Kauri Cliffs you will depart for the West Coast in your Tesla Model X. On arrival at the historic settlement of Omapere, near the entrance to the Hokianga Harbour, you will be met by a cultural guide for a tour to Tane Mahuta, the world's largest known Kauri tree. The Maori mythology surrounding this majestic tree and the Waipoua forest will leave you spellbound. Afterwards, you will depart with the Waipoua Forest Trust Team to plant your very own Kauri tree as part of their rehabilitation programme. This is a unique experience, and is an opportunity to give back to the land you are visiting. Lunch will be a iconic New Zealand feast of Fish and Chips on the beach overlooking the Hokianga Harbour, before driving back to the Lodge at Kauri Cliffs in your Tesla Model X.
Pre-dinner cocktails and dinner at the lodge will conclude your day’s adventure to the West Coast. Following breakfast, you will depart in your Tesla Model X for your drive south to Auckland. Your journey will follow the stunning eastern coastline of the North Island, during which we recommend a stop for lunch at the Waipu Pizza Barn, a favorite of locals and visitors alike. Arrive at St Mary's Bay Residence, your luxury accommodation for the duration of your stay in Auckland. Once you have settled into your accommodation, you are free to enjoy the afternoon at your own leisure. Your options for dining include a selection of the very best of Auckland's award-winning cosmopolitan restaurants. Alternatively, you may choose to enjoy an in-house and personalized dining experience, specially prepared by the kitchen team at St Mary's Bay Residence to cater for your individual appetite and needs. Affording stunning harbor views, St Marys Residence is an exclusive property located in the heart of Auckland City. It is the perfect home-away-from-home and offers a totally bespoke experience for its guests. The home is spacious and luxurious, in the style contemporary chic. Owners, Michael and Manjit, have acquired a great passion for cuisine, especially when it comes to showcasing organic and sustainable New Zealand produce – all prepared by their experienced and renowned local chef. Following breakfast, you will begin your day with a Sea Plane flight to Waiheke Island, courtesy of Auckland Sea Planes. 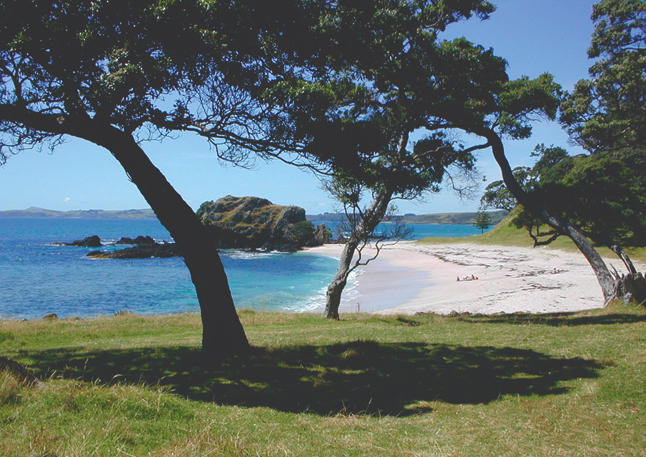 A private tour of Waiheke Island, will be conducted by your personal Eighth Wonder guide. This tour will showcase the very best experiences on the island, including a breathtakingly beautiful horse trek that includes a stop-off at the world famous Te Matuku Bay Oyster Farm to enjoy the very best Oysters in the region, followed by a food-and-wine tasting and lunch at Tantalus Estate. Arrive back at your accommodation, and once again have the choice of dining in-house, or alternatively, enjoy one of the great restaurants Auckland has to offer. Following breakfast, you will drive south to Huka Lodge in your Tesla Model X. Your journey will lead you down the center of the North Island, through lush green farmlands and across tranquil rivers. Arrive at Huka Lodge and enjoy the afternoon at your own leisure. Your option for dining this evening at the lodge is a choice of one of twenty sublime, deliberately romantic indoor and outdoor private dining venues, that offer ambiance and seclusion, tucked away in the most unexpected places. 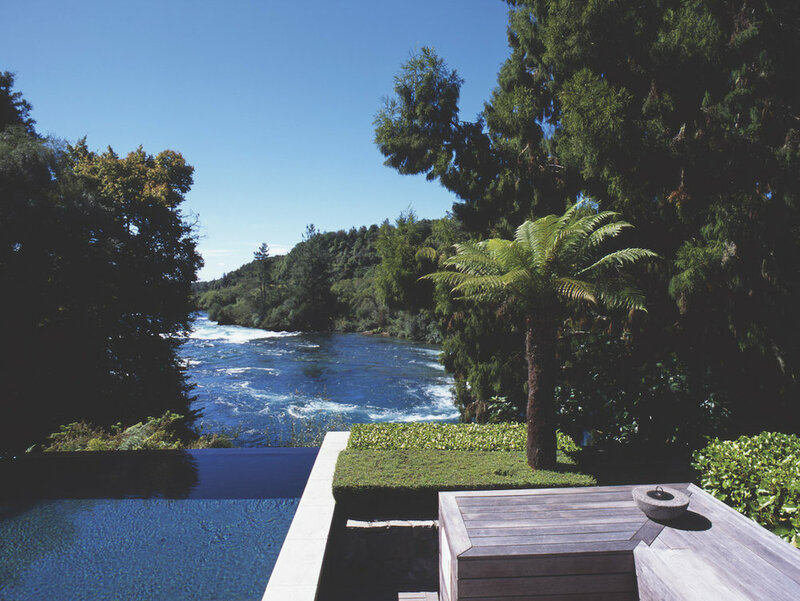 Founded in the 1920’s, Huka Lodge is considered the iconic New Zealand retreat. Sought by the world’s most discerning travellers, it enjoys an unrivalled riverside location and offers superb hospitality. Its 25 rooms are set in 17 acres of magnificently manicured grounds, nestled along the banks of the Waikato River. The rooms are split between 18 Junior Lodge Suites, one Lodge Suite and the two exclusive Huka Lodge Cottages. The Owners Cottage provides secluded accommodation for a maximum of eight guests in four bedrooms, and the superb Alan Pye Cottage has two bedrooms for four guests. Following breakfast at the lodge, you day will continue with a helicopter flight south to the Kaimanawa Range wilderness, with possible sightings of wild horses and red or Sika deer along the way. Land next to the famous Rangitikei River, famous for its trophy-sized Rainbow Trout. Your return flight will take you via areas of volcanic activity and craters of the Tongariro National Park, or alternatively, north via the famous Huka Falls, following the Waikato River to the Wai-O-Tapu and Waimangu geothermal regions. Fly over and around the dormant volcanic cone of Mt. Tarawera, which last erupted in 1886. Return to Lake Taupo via some of the spectacularly lush farm and forest lands of the central North Island. After your 80-minute flight, you will land and board a private boat for a trip across Lake Taupo. Whilst cruising back to Taupo Marina, enjoy a delicious buffet lunch and try your hand at trout fishing as you take in the spectacular scenery. Clay target shooting is also available if weather conditions permit. Arrive back at the lodge, where dinner is served. On your final full day at Huka Lodge, you will depart in your Tesla Model X to play 18 holes of golf at Kinloch Golf Club. This championship course was designed by Jack Nicklaus, and is one of the toughest tests of golf in the country. Lunch is available at the lodge, and feel free to enjoy your afternoon at your own leisure. Dinner will be served at the lodge. Following breakfast it is time to drive your Tesla Model X to Cape Kidnappers, located on New Zealand's eastern-most coast. The Taupo to Napier road winds its way through rugged hills, beautiful valleys, gentle plains, and huge vistas. Close to your destination, you will drive through the coastal Art Deco city of Napier, before arriving at the award-winning Craggy Range Winery for lunch. After lunch, it is just a short drive to your destination for the day, the Farm at Cape Kidnappers. Enjoy the afternoon at 'the farm' at your own leisure. This evening, experience a special dinner in the property's Wine Cellar, showcasing the best of Hawke’s Bay wine and food. You’ll start your day with the challenge of a dramatic 18-hole golf course, designed by architect Tom Doak. After the round, take in the beautiful scenery over lunch in the club house. In the afternoon experience the very special Sanctuary Discovery Walk, accompanied by sanctuary manager Beau and his team, who will lead you on an adventure across the property in search of the New Zealand Brown Kiwi. This is an incredible opportunity, one that can only be experienced as a guest at Cape Kidnapperst, to interact with New Zealand's national bird – the Kiwi. Using radio tracking and monitoring devices, you will take turns searching for this elusive, flightless creature. Once found, guests will have a chance to get up close and personal with one of New Zealand’s most endearing and rare birds. Beau will then introduce you to one of the few very special Tuatara who have been released and are now thriving at the property. The Tuatara, a species only found in New Zealand, is the last surviving member of the dinosaur family with a lineage dating back more than 200 million years. Pre-dinner drinks and dinner are at your leisure this evening, to be enjoyed at a time that suits you in the lodge dining room, or at one of the private dining spaces available. Following a leisurely breakfast, you will depart south in your Tesla through the farming regions of Southern Hawke's Bay and the Wairarapa, before arriving at Poppies in Martinborough for lunch. Following lunch and a short drive, you will arrive at Wharekauhau Lodge in Cape Palisser Bay on the Southern Coast of the North Island. Enjoy the afternoon at your own leisure. In keeping with any luxury farm stay New Zealand experience, it wouldn't be complete without a farm-to-table dining experience. The kitchen at Wharekauhau has adopted a 'locavorian' approach to planning menus and selecting produce, whereby everything is sourced fresh from their own gardens, or brought in from the surrounding area. Perched on cliff tops overlooking Palliser Bay, Wharekauhau Lodge has a dramatic, unique style, based on an Edwardian theme, all set in 5,500 acres of rolling farmland. 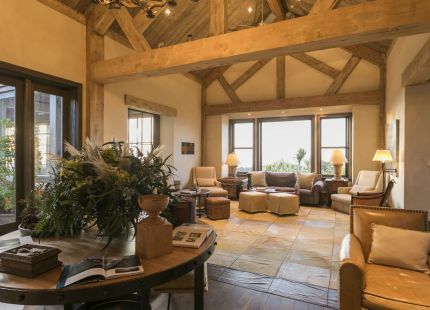 The lodge itself features a large country kitchen, open wood-burning fireplaces, formal dining, wine cellar, and intimate library room. The grounds are host to 13 cottage suites and a family retreat ‘Wharepapa Cottage’. Each suite contains super-size king beds, an open gas fireplace, under floor heating, double spa bath, and many more features. Wharepapa Cottage is a complete self-contained cottage comprising three bedrooms and one large open plan living/kitchen/dining area. This cottage is ideal for longer stays and for families. Begin your last full day with a tour of the working sheep station on property, in a comfortable 4WD vehicle. This is an absolute must for all Wharekauhau visitors. Bordered by the Rimutaka Ranges and Pacific Ocean, this classic Kiwi Romney sheep station features all the activities that have created New Zealand’s legendary farming heritage, including sheep shearing demonstrations, sheep dogs in action, and daily farm events. From here, you will travel along the rugged coastline to the picturesque, historic fishing village of Ngawi, looking back over Palliser Bay to Wharekauhau. Continue on to one of New Zealand’s largest Brown Fur Seal colonies, where seals bask in this unspoiled natural environment. Whilst there, climb to the top of the lighthouse for magnificent views. On return, stop at the historical Lake Ferry Hotel for their famous fish and chips and some local beverages from the southernmost tip of the North Island. Your last evening will be a casual dining experience at the lodge. Following breakfast, it is time for your final drive in your Tesla Model X, to New Zealand's capital city, Wellington. We will provide you with the very best sights in the capital before you arrive at Wellington Airport for your flight back home. An Eighth Wonder Travel representative will be on-hand to take the Tesla Model X off your hands and wish you a found farewell - Haere Ra.